Lake Mary, Florida — Shellie Zimmerman has recently taken criticism from the public claiming she is out for the money George Zimmerman stands to gain in a lawsuit filed against NBC and Al Sharpton for editing 911 tapes during the Zimmerman Trail involving the death of Trayvon Martin. Many believe Shellie Zimmerman is purposely trying to create problems for George Zimmerman to get a reaction out of him in order to have him put behind bars. Shellie Zimmerman filed divorce papers and is demanding she be named beneficiary of his finances if anything happens to him even after she divorces him. George Zimmerman was taken into custody by Lake Mary police after a dispute between his estranged wife Shellie Zimmerman and her father. Later he was released from ‘investigative detention’ and is free to leave the scene at any time. Police say George Zimmerman did not request his attorney and is fully cooperating with investigators, however George Zimmerman’s attorney was notified of the incident and his attorney did arrive on the scene at 4:25 p.m.
Shellie Zimmerman and her father have both requested their attorney to be present and their attorneys are in fact on the scene. Lake Mary Police officer Zack Hudson says the incident is being investigated as a domestic dispute and it’s currently under investigation. Officer Hudson says the aggressor is not yet known and that is the reason they are still investigating. He says every detail has to be investigated from A-Z. 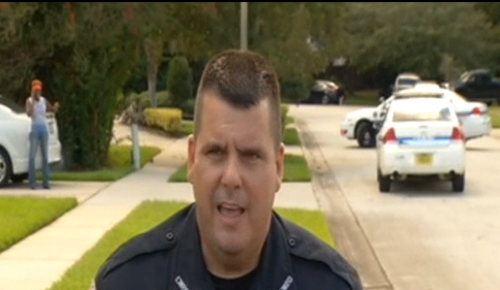 The 911 call went out as George Zimmerman was threatening Shellie and her father with a firearm, however officers again at this time are not specifically stating they did locate a weapon. In the 911 Call Shellie Zimmerman alleges that George Zimmerman punched her father in the face. Shellie Zimmerman in the 911 call says George Zimmerman constantly had his hand on his gun and was threatening to shoot her and her father. The Fire Department was called to the scene however all parties declined to be transported to the hospital. At this time it is unclear if someone was actually injured during the altercation. Police say they are investigating a possible battery between George Zimmerman and Shellie’s father but could not go into further detail citing it is an open investigation. If the investigation does reveal that George Zimmerman did commit aggravated battery while brandishing a weapon, it could carry a mandatory sentence and George Zimmerman could find himself back in front of a jury. All of the details have not yet been released. This is a developing story. Check back for further details.